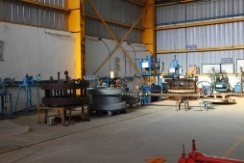 The Indian industry begins the fiscal year in April. Business plans are drawn and fresh targets set. Advance Valves too begins the year by consolidating on last year’s achievements and planning for positive business growth this year. Advance Valves bagged the Best Product Design Award at Bry Air Awards at ACREX ‘13 for large sized manual balancing valves. This novel solution has been patented, and has proven success of design and performance both. The 14th edition of ACREX India was held from 7th to 9th March 2013 at Mumbai organized by Indian Society of Heating, Refrigerating and Air Conditioning Engineers (ISHRAE), The theme was "Dedicated to an eco-friendly environment" aiming to surpass the expectations of the previous shows and set new precedents and standards for all such future Exhibitions. 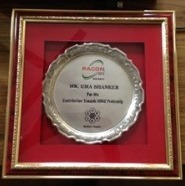 ISHRAE Kolkata, organized RACON 2013, the theme chosen for this year was "Designing Energy Efficient & Safe Environment". Advance Valves Chairman, Mr. Uma Shanker was felicitated with the recognition for significant contribution towards HVAC fraternity over the years – specifically about having introduced and taught balancing to the Indian Air-Conditioning industry. ISHRAE has been spearheading the interests of the HVAC fraternity in India, in the last couple of decades, by bringing new technologies worldwide to the knowledge and reach of various groups like Users/ Clients, Consultants, Architects, Contractors, Manufacturers etc. as a well knit network through various technical seminars, symposiums & expositions. As part of our commitment towards service at the doorstep to our clients, Advance Valves has recently established a new office in Mumbai, to provide prompt service across the western region. The office is centrally located at LBS Marg, Mumbai. The fiscal year has begun well as we have manufactured and shipped a wide range of Dual Plate Check Valves out of India with NB 50mm – 1200mm and rating ranging from ANSI #150 - #1500. These valves have been supplied to Bechtel, Houston for the Sabine Pass Liquefaction Project based at Louisiana. Sabine Pass is the natural outlet of Sabine Lake into the Gulf of Mexico. Starting with 2, it will accommodate up to 4 LNG trains capable of processing approximately 2 Bcf/d of natural gas. The nominal capacity of each liquefaction train would be approximately 4.5 million tons per annum (mtpa). Advance Valves has maintained its stronghold as a reliable supplier having successfully supplied cryogenic valves to Sabine Pass when it was initially developed as a receiving terminal 8 years back. 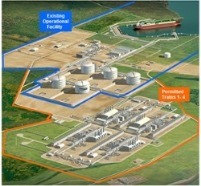 Today Bechtel has invited Advance again when the site is being converted to an export terminal for the US Shale Gas. 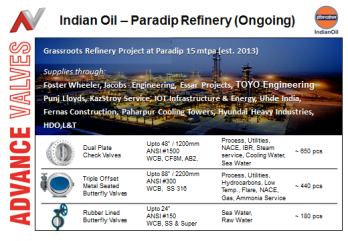 Indian Oil Corporation Ltd (IOCL) will be commissioning its Paradip refinery in the third quarter of 2013-14. This project is expected to complete all mechanical equipment installation by June 2013 while the stabilization process will take another three to four months. Advance Valves has supplied valves for this prestigious project from almost its entire range, including the High Performance Triple Offset Butterfly Valves up to 2200 mm and Dual Plate Check Valves. The pictorial rendition alongside will reflect our supplies for the many packages for this project. 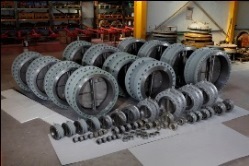 After having developed the Double Flanged Concentric Butterfly Valves Range for sizes upto to 24” NB with rating of ANSI #150, Advance Valves has now successfully supplied and commissioned upto 24” during the year with a quick time-to-market. This range is now available as a standard product from Advance Valves for all including the International Market, particularly the Oil and Gas industry. This model has a long face-to-face, as per API 609 Cat B, accommodating ASME B16.5 flanges. The integrally moulded liner has a rating ANSI #150 (20 bar) as compared to lose / replaceable liner valves which are generally not full rated. 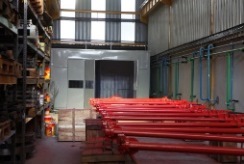 Keeping in step with the continued business confidence our valuable clients have placed on us, we have recently upgraded the manufacturing facilities of our global plant A new – and expanded – Painting & Inspection area has been constructed to facilitate higher throughputs. This includes setting up Cryogenic testing facilities for our valves with sizes of up to NB of 60”! 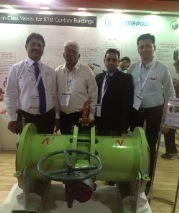 Apart from the two conferences mentioned above, Advance Valves was exhibiting at the Chemtech World Expo’13, Mumbai, the International Exhibition and Conference encompassing the Chemicals, Pharmaceuticals, EPC, Automation, Water and Energy & Environment sectors, This was held in Mumbai between January 15-18, 2013. The event, supported by CHEMTECH Foundation, displayed state-of-the-art technologies, equipment, accessories and services from national and international players in each sector. 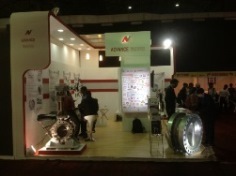 Advance Valves stall received a healthy level of footfalls.